Chicago Bicycle Accident Lawyer | Illinois Bicycle Lawyers at Keating Law Offices: Illinois Bans Cellphone Use Statewide. Can The New Law Reduce Bicycle Crashes? Illinois Bans Cellphone Use Statewide. Can The New Law Reduce Bicycle Crashes? As Illinois law stands right now, there are a number of different laws in different municipalities regarding cell phone use while driving. That is soon to change. On January 1, 2014, Illinois drivers will begin facing fines of $75-$150 for talking on hand-held cell phones while driving. The bill, signed into law by Governor Pat Quinn on Friday, August 16, 2013 piggybacks Illinois' existing ban on texting while driving which has been in place for years. 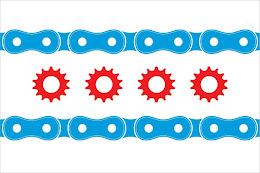 The Illinois Bicycle Lawyers of Keating Law Offices fully support any legislation which may result in even a minor reduction in driver distraction. The ban on texting while driving was brought into law in Illinois after the death of Matt Wilhelm in September of 2006. Matt Wilhelm was an Illinois bicyclist riding his bike on the shoulder of a downstate road. Matt was known as a conscientious and safety minded rider. He rode to the side of the road and always wore his helmet. But what Matt was unable to plan for was a teenage driver who swerved off of the roadway onto the shoulder and struck Matt on his bike. The teenage driver, by some accounts, blamed her actions on the fact that she was text messaging while driving and became distracted. The sponsor of the new law banning cellphone use while driving throughout the state, State Representative John D'Amico, cites eliminating driver distraction as the primary aim of the ban. Representative D'Amico explained to the Chicago Tribune that he believes when he is talking on a hand-held cellphone, his "peripheral vision is much lower" and his "concentration level is not where it's supposed to be." According to the Tribune, many private citizens and public figures agree with D'Amico's beliefs and support the new legislation, including both Kane County Sheriff Pat Perez and Deputy Executive Director for the Governors Highway Safety Association, Jonathan Adkins. Adkins explained that in addition to eliminating driver distraction, the new legislation makes it much easier to enforce the texting ban because drivers will no longer have any excuse to have cellphones in their hands while on the road. On the flip side, there is another group of people who are not convinced that eliminating hand-held cellphone use will have a significant impact on drivers' overall level of attention. Russ Rader of the Insurance Institute for Highway Safety noted that cellphones are one among many distractions diverting drivers' attention, as most drivers are also prone to distractions such as food, drinks, the radio, or even daydreaming. Rader further noted that there is not conclusive evidence supporting the proposition that eliminating hand-held cellphones will result in a significant reduction in distracted driving or crashes. Even Representative D'Amico admits he has no scientific support for his belief that talking on a hands-free device is safer or less distracting than talking on a hand-held device. Talking on a hands-free device while driving will remain legal under the current legislation. As an Illinois firm representing injured bicyclists throughout the state, we routinely advocate on behalf of clients whose injuries are a direct result of driver inattention. The ban most certainly will not result in an increase in crashes, and to the extent it eliminates even a negligible amount of collisions, we fully believe that the ban is worthwhile. At worst, we view this legislation is a small inconvenience that has the potential to yield extremely significant benefits if even a single collision is prevented.